The waste management process is an incredibly important operation for any business that handles waste material – from the time it’s made – all the way to its disposal. This process includes how your business collects, transports, recycles, processes or gets rid of its waste. Managing your waste can lead to lost opportunities or profits. It’s about being efficient with the raw materials you use and making the most out of every stage of your production processes. If you aren’t managing your waste properly, you’re putting the health of your employees and the environment at risk, thus making yourself liable in front of the law. For that reason, people use many different types of equipment, tools, and processes for managing waste. One of the most popular pieces of equipment around industrial facilities is the self-dumping bin, also known as a self-dumping forklift hopper, as it requires the use of a forklift. A self dumping forklift hopper allows the operator of the forklift to safely and efficiently dispose of the waste, thus significantly reduce the risks associated with heavy work. Instead, you get a hands-free operation that makes your entire site job much safer. These forklift hoppers are typically designed using high-end steel or other materials that can endure a lot of abuse even in rugged industrial environments that handle dangerous materials. That being said, a self dumping forklift hopper usually experiences extreme wear and tear only after years of abuse. Some manufacturers use exclusive hinge pins to help prolong the lifespan of their machines. This allows your employees to safely handle risky waste without endangering themselves. Forklift hoppers are highly customizable, and can accommodate your special needs. For instance, if you plan on handling toxic materials or sharp objects, you can prepare your equipment to do so. Hoppers come in a wide range of shapes and sizes to accommodate your specific needs. Some manufacturers provide a basic model on which you can build upon depending on your needs. With that said, you can build a hopper that fits the specific types of forklifts you use, to handle specialty materials, fluids, and irregularly shaped items. Hoppers can usually handle anywhere between 500kg to 3000kg, sometimes even more. 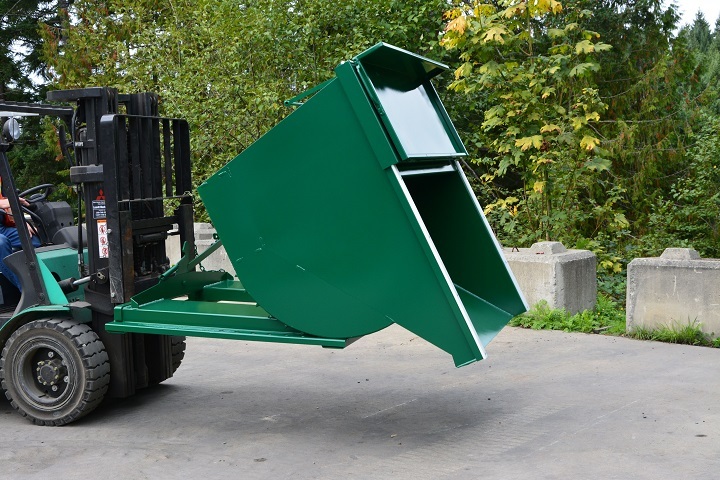 Furthermore, self-dumping hoppers can dump all of the materials at an extended angle in order to ensure that all contents are emptied safely from the operator. This will reduce the chance of engulfment, which is a common occurrence when handling industrial materials like sand, dust, sawdust or construction materials.